Teriyaki - one of those many food terms that has somehow been lost in translation. Teriyaki is a cooking technique where foods are broiled or grilled with a sauce made from soy sauce, mirin, and sugar. The ratio of soy sauce to mirin/sugar varies depending on the food being cooked. 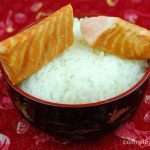 There is no one-size-fits all teriyaki sauce, and it is highly encouraged that you adapt my easy recipe for tender flaky teriyaki salmon to your tastes. In a jar, shake together the soy sauce, mirin, and sugar until the sugar has been dissolved. Pour the soy sauce mixture into a small glass baking pan. Add the salmon fillets to pan, being sure to first coat each side of the fish with sauce. Set the pan under the broiler for 3 minutes. Take the pan out, and carefully flip the fish. Set the pan under the broiler for another 3 minutes. The fish is done if it easily flakes with a fork. Serve this simple fish over rice, as part of a salad, or with your favorite sides and enjoy. *If you decide to scale this recipe, I recommend using the amount of sauce I have listed here as the minimum amount, or so the sauce is about 1 cm in depth.